The second Bristol (DD-857) was launched 29 October 1844 by Bethlehem Steel Co. San Pedro Calif. sponsored by Mrs. August Frederick Eberly; and commissioned 17 March 1945 Commander K. P. Letts in command. Bristol departed San Diego 13 June 1945 enroute to Pearl Harbor arriving 19 June 1945. Arriving at Guam 29 July she Joined TG 30.8 a logistic support group supplying TF 38. On 5 August 1945 Bristol collided with Ashtabula (AO-51). Bristol's bow was damaged and she returned to Guam for repairs. Repairs completed 1 September she departed for Far Eastern occupation duty. Her tour of duty ended 21 February 1946 and she returned to San Pedro 15 March. In April 1946 Bristol proceeded to the east coast and reported to the Atlantic Fleet. She operated along the east coast until February 1947 when she steamed to England for a cruise in European waters that lasted until August. Between August 1947 and September 1948 she conducted local operations in the Atlantic and from September 1948 until January 1949 made a second tour of Europe. Upon return she was designated as a Reserve training ship and operated for the next 18 months out of New Orleans La. During the summer and tall of 1950 Bristol visited several Caribbean ports with interim periods of training at Guantanamo Bay Cuba. 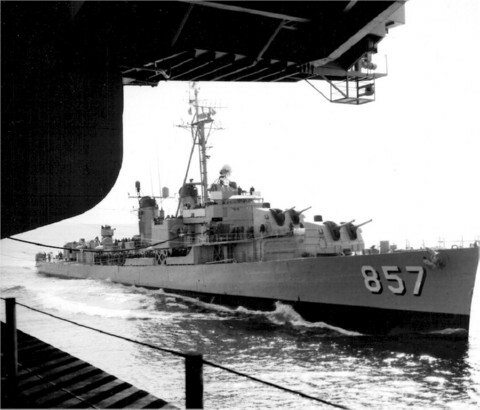 Bristol's homeport was changed to Newport 21 October 1950 and after refresher training at Guantanamo Bay she reported to Newport for general duty. On 5 March 1951 Bristol proceeded to the Mediterranean for duty with the 6th Fleet returning to Newport during the summer. On 2 October 1951 she commenced a round-the-world cruise which took her first to Korea where she served from 31 October 1951 to 27 February 1952. She then returned to Newport via the Suez Canal and the Mediterranean arriving 2i April 1952. Since that time Bristol has served with the Atlantic Fleet and has carried out her normal peacetime operating schedule along the east coast in the Caribbean and with the 6th Fleet in the Mediterranean.